The mood in Sandpoint is brighter. The murders have stopped and there have been no undead sightings. There is talk of another Swallowtail Festival. Seelah has been examining the letters they found in the Manor. “It is a shame we shall not be here to join them.” she says. Seelah gathers the papers into a pile. Lini strokes her tiger behind his ear and looks out at the town. “I shall miss this place.” she says. Sajan is in the square doing one last magic trick for the children. The journey to the city is uneventful. Bandits and Goblins are scarce these days. Magnimar is vast compared to to the township of Sandpoint. The capitol of the region, all roads lead here. The Crusaders stand on a hill overlooking the sprawling city-scape. Sajan hands her his water flask. Amiri laughs. 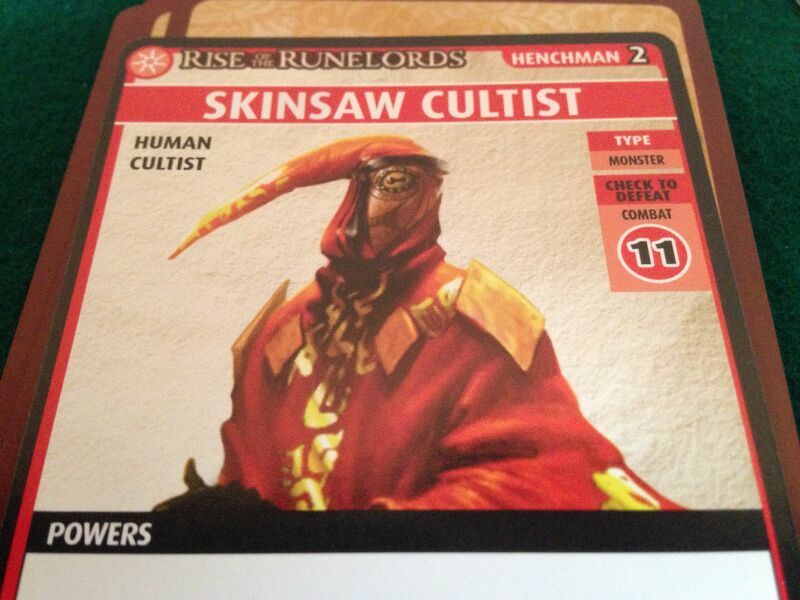 Once inside the city, they split up and begin the search for the Skinsaw Cult of Norgorber. Seelah’s first guess for the Cult’s location is the Temple. She spends some time searching the cloisters but finds no sign. She passes by many exhibits and artifacts, hardly glancing at the treasures. Her eyes are on the priests and their congregation. Lini suspects that if the Cult are arcane then there should be clues at the Academy, so she scouts the halls looking for anything out of the ordinary. She casts a Detect Magic spell, but finds nothing. 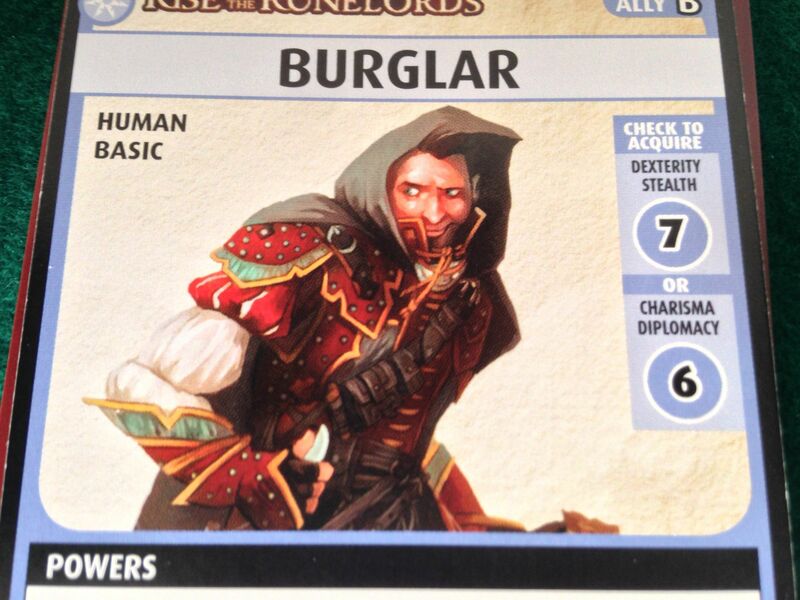 While she is busy with the spell, a Burglar steals her Crown of Charisma. She turns to send Smilo after him, but the tiger is nowhere to be seen. She suddenly realizes she is alone amongst the gloomy bookcases. Amiri figures it is worth asking the Guard at the City Gates if he has seen anyone suspicious coming or going. The Guard grins and points at the Skinsaw Cultist trying to sneak into the city even as they speak. “Hey, you in the weird outfit!” shouts Amiri. The orange robes of the cultist stand out from the crowd. The Cultist starts to run but she trips him with her warhammer. The Guard laughs. Amiri picks the Cultist up by his collar. His mask is askew and he tries to spit at her but it just dribbles down his chin. Sajan is exploring the Mill. Sawdust fills the air and hammering echoes from the walls. Sajan blinks to clear his eyes. The cacophony is disorientating. He edges around the building, unable to properly tell what is around him. A huge hand punches through the wall and grabs him by the neck. A Zombie Giant is loose in the city. Sajan reacts by touch. He hooks his heel under the Zombie’s armpit and snaps his knee into its jaw. It goes down like a mountain. In the Academy, a clawed hand reaches between the volumes and snags Lini by the throat. She batters at the Ghoul’s arm with an encyclopaedia until it retreats into the shadows. Gasping, she retreats through the bookshelves and rests in the cryptozoology section. She notices an orange robe sweep past the end of the aisle. Following, she sees a Skinsaw Cultist furtively checking the archives. She blasts him with a Holy Light spell, and he vaporises in a cloud of foul-smelling dust. Amiri stands on the dock down at the Waterfront. After severe questioning, the captured Cultist had hinted that an important shipment is expected. The stevedores are staring at Amiri’s leggings but her eyes are on the approaching barge. 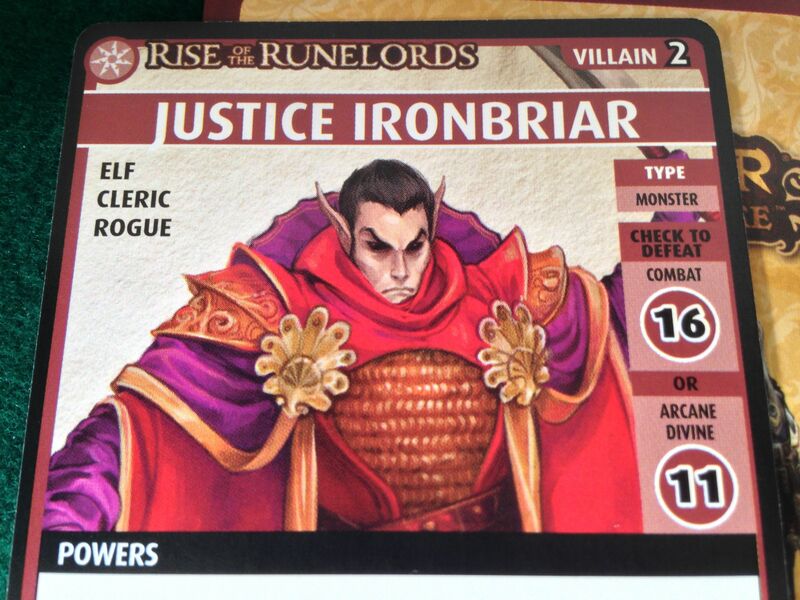 The gangplank smacks down, and who steps off the boat but Justice Ironbriar, elven head of the Magnimar High Court. Can he also be the head of the Cult? Amiri backs into the shadows and Ironbriar passes an arms-length from her. He is inspecting the cargo. Amiri watches him for a moment, then slips away to inform the others. In the Mill, Sajan narrowly avoids a Slashing Blade as the plank-sawing machine collapses. He spies the Goblin Pyro responsible for the sabotage. The Goblin has a torch ready to ignite the sawdust. Sajan launches himself across the planks and kicks the torch out of the Pyro’s hand. The Goblin runs away but its torch lands in a pile of shavings. Before they can explode in flames, Sajan throws himself on top. There is a muffled boom. Sajan slowly gets to his feet and brushes at the charred edges of his tunic. A Skeleton Horde spreads out into the city. 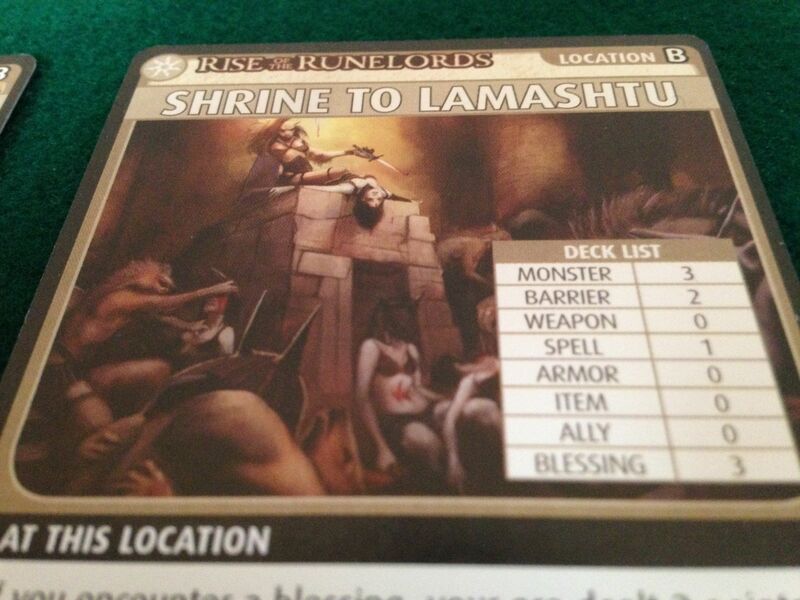 The Shrine to Lamashtu sounds likely as a cult base, so Lini heads there from the Academy. The shrine is quiet, with only a Bugbear chewing on a pile of bones. Lini blasts it with an Inflict spell. The Bugbear’s body collapses into the bones with a clatter, but the clattering continues and a Skeleton Horde rises from the pile. Lini fights one off, but the others swarm over her and into the city. Amiri enters the Temple to update Seelah and immediately recognises a Skinsaw Cultist by his bright orange robe. She dodges behind a pillar and as he walks past she smacks him with the flat of her blade. She has him trussed with his own cloak by the time Seelah arrives. They head over to the Shrine to join Lini. As they enter, an evil force presses down on them, sending jabbing pains through their heads. They stagger amongst the columns. Lini is exhausted after dealing with the bugbear and skeletons. She casts an Augury spell to sense what is lurking in the darker chambers and spies a Skinsaw Cultist chanting over a profane altar. Seelah and Amiri are delayed at the entrance, so Lini musters her strength and transforms into bear shape. Lini-bear and Smilo charge down the gloomy passageway but the cultist hears them coming. He blows out the candles, snuffs out the incense and slips out the back way. 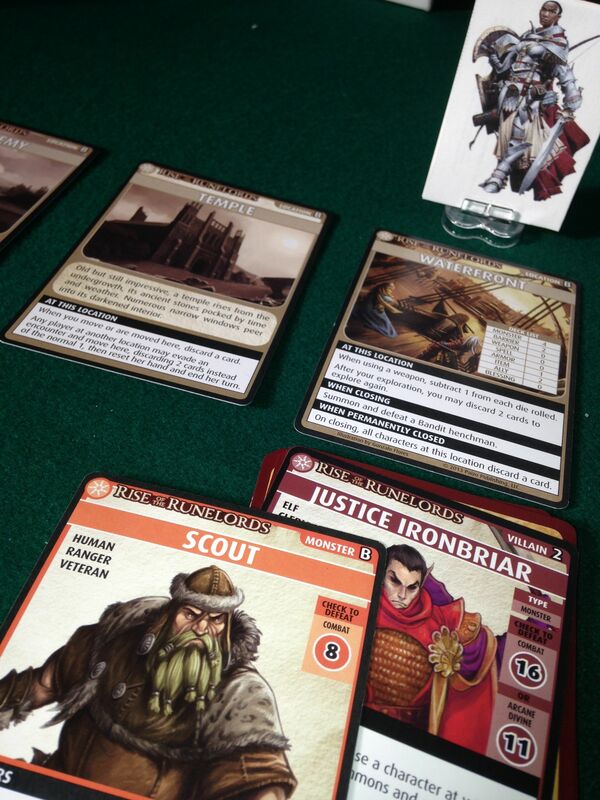 Over at the Mill, Sajan opens a weapons chest and finds a magic sword and dagger. Neither are his style so he straps them across his back and continues his search. His Guide is leading the way when an arm reaches from behind a pile of planks and drags her into the shadows. Sajan spots the flash of orange. His hand whips to his back and snaps forward. The magic dagger flashes as it flies and there is a thud and a gurgling gasp. The Cultist lies dead in the shadows. Sajan helps the Guide to her feet and they peer through the dust. The noise is deafening, so he signs for her to follow him. With time running out to capture the Villain, Seelah heads for the Waterfront. She can see him directing the loading of crates onto a cart. She circles around behind stacks of packing cases but Ironbriar has a bodyguard. A crossbow bolt slams into her shoulder and the Scout closes in for the kill. Seelah swings with her warhammer and he tumbles into the water. Seelah grits her teeth and yanks the bolt out of her shoulder. 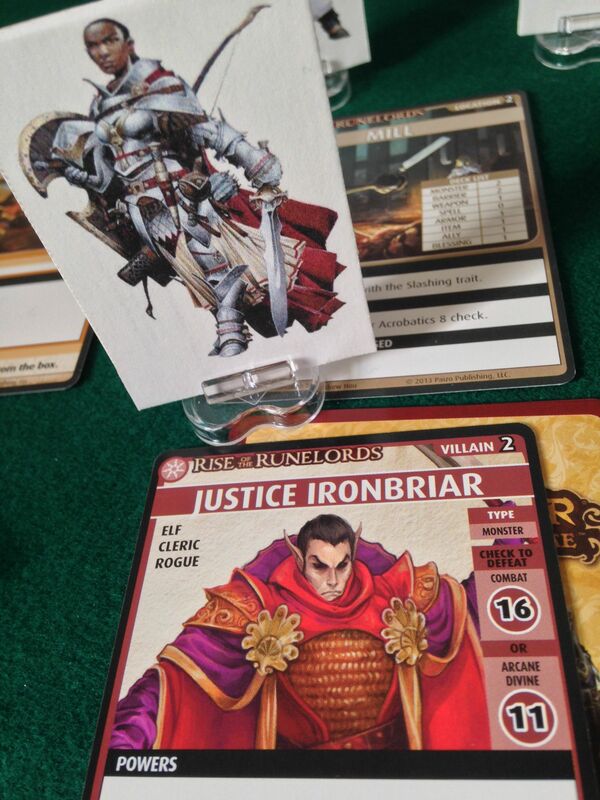 The splash of the body alerts Ironbriar. He draws his magic shortsword and swings at Seelah but she is ready for him. Her warhammer smashes into his side and he staggers backwards to the edge of the gangway. Seelah starts to swing again but he snarls and drops into the water. Seelah watches the ripples subside and frowns. Amiri is searching for Lini at the Shrine. She hears a creak as a section of wall swings open and a Skinsaw Cultist steps out of a secret passage. Amiri sweeps up behind him and pulls his mask sideways. He shrieks in surprise and runs into the wall. Amiri drags the cultist out into the light. She is about to question him when she sees a damp figure dodging from shadow to shadow towards the Mill. She pulls the cultist’s robe over his head and hooks it on a statue then dashes after the scurrying form. As she runs, she sees the glint of Seelah’s armour, sprinting from the waterfront. They meet at the Mill entrance, pause, then kick in the door together. Sawdust sticks to Ironbriar’s clothes in clumps. His once-pristine hair is wet and bedraggled. He clutches his sword in one hand and his side with the other. His cries of rage are drowned by the grinding of gears. There is a summoning flash and a Giant Gecko appears and leaps at the heroes. Amiri slices off its head with a single swipe. Its body skitters into a corner. Ironbriar wipes streaks of sawdust from his face and lunges at Seelah. She takes a step backwards and Sajan tosses her his magic longsword. She catches it, calls on the Maker and sweeps it through the dust and noise and Ironbriar’s defences. The machinery whines and squeals around them. Ironbriar lies in the sawdust, shavings clinging to his face. His eyes flick past Seelah’s shoulder. She turns and follows his gaze out of the window. 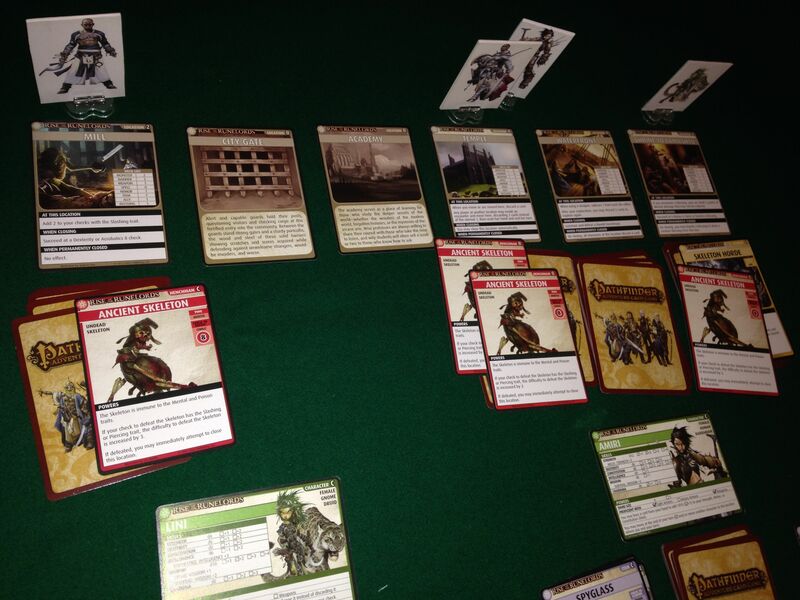 Posted in Blog Posts and tagged PACG, Pathfinder Adventure Card Game, session report on February 25, 2014 by Tim.